Our 19 days on the road last month provided so many epic memories it’s difficult to select the highlights. Here is just a brief account of some moments we’ll bring up over beers with friends for years to come. Nick demonstrates the snowplow method of bear avoidance. We had done plenty of research on bears, hiking around bears, bear attacks, etc. before our travels. 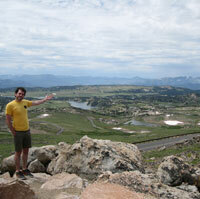 We basically spent time in every major grizzly and black bear habitat in the lower 48 states. Tip: don’t Google “bear encounters: Glacier National Park” on YouTube if you want to feel at ease on that first hike in bear country. One strategy we were prepared to use is known as the “snowplow method” which involves finding a larger group of hikers and following 50 yards behind them, the logic being that the other group will scare away a bear first or deal with any surprises. 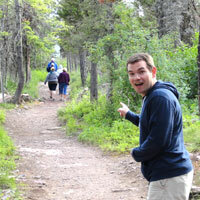 Our encounters in Glacier happened when we least expected them, we never spotted a bear while on a hike. 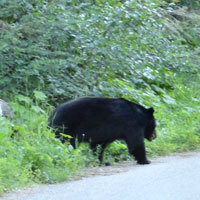 Our first one was a small black bear grazing along Going-To-The-Sun Road just after entering the park. Viewed from a car, a bear is exciting and not scary at all. The second sighting came while waiting for a ferry boat, a giant grizzly roaming high on a mountain above Lake Josephine, visible only with binoculars. The third and fourth bears were the ones that really got the heart rate up. We were preparing to have dinner at the Swiftcurrent Lodge when we decided to walk around the grounds and find the trailhead for the hike we were planning for the next day. Heading back toward the lodge along the road, we heard snapping twigs and saw movement in the trees ahead. We stopped in our tracks … grizzly, 20 yards straight ahead. He or she didn’t seem to notice and/or care about our presence so we just stood quietly. Then “what’s that?” just a few yards behind the grizzly was a large black bear following. As far as we know, this is a rare occurrence, since bears are generally solitary animals. They browsed through the trees and disappeared off to our right, so we continued cautiously on our way. A moment later heard some noise and turned around. They were coming out of the woods and onto the road behind us. They had better things to do than pay attention to a couple of hikers and so continued on their way. It was a cool man/nature moment, but that’s about as close to two bears as I care to get. On our last day in Grand Teton National Park, we signed up for a 6:30am river float trip on the Snake River. Our guide Wayne is one of those men whose life should be made into a movie. In 1965 he was in the process of hitchhiking from New Orleans to Alaska when he ended up in Jackson, WY and has been guiding Western river trips ever since. He knows about everything there is to know about the plants, animals, geology and ecology along the Snake River. 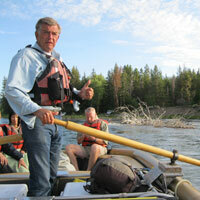 When not guiding in the Tetons, he also runs his own river adventure company in Idaho, Salmon River Rafting Company. were perfectly lit by the early-morning sun. I don’t wake up before dawn for much, but the scenery and wildlife were well worth the 5:30am alarm. We saw bison, a beaver, bald eagles, pronghorn, osprey and bank swallows. Surprisingly, the Snake River in Grand Teton National Park actually has a steeper gradient than the Colorado River in the Grand Canyon, but the Snake is not whitewater due to the smoothness of the river bottom. As a result it’s a nice leisurely trip, suitable for all ages. About halfway through the ride, a single, fluffy cloud formed near the highest summits. 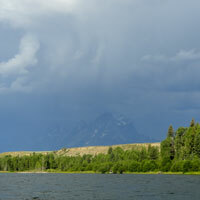 Wayne assured us that it doesn’t generally rain much in the Tetons and electrical storms are quite rare. Soon the peaks were shrouded in gray and the cloud expanded to massive proportions. Then the lightning began … Great. Having both just read the book “A Bolt From The Blue,” a story of a lightning strike and rescue on Grand Teton, we were a little concerned. The rain began to pour as Wayne passed out rain ponchos and hurried the raft along with some additional paddling, keeping us in the center away from any trees that might attract lightning. 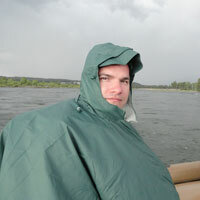 The mood lightened when a gust of wind flipped Nick’s poncho up and over his face to the delight of everyone on board. We made it to the end point after about a mile and a half of passing through pouring rain. This proves that sometimes weather doesn’t work out as planned, but in the end can make an experience even more memorable. We’ve reached the top! Or not. Only in Wyoming can you get away with stopping traffic that long. After that delay, we continued up the switchbacks, reaching an overlook that we thought was the peak, we stopped the car, snapped photos and marveled at the view. Once back on the road, I looked ahead and said “Wait .. the road is going higher.” That wasn’t even the top. The highway continued to twist higher and higher until we reached the true peak, where there’s a chairlift for skiers (how do they get up there?) and steep dropoffs leading to lakes in the valleys below. After that, we crossed back into Montana and began a series of extreme switchbacks that led us back to lower elevations. In the process, we clocked a bike rider coasting downhill at approximately 40mph. I love some crazy mountain driving, but was exhausted after those 69 miles. Good thing Red Lodge, Montana and the Red Lodge Ales brewery and beer garden is just after the end of the pass, providing a good resting place to refuel before setting out across the flattened prairie portion of Montana toward North Dakota. 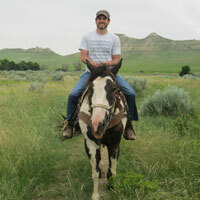 Those were the names of our horses at Peaceful Valley Ranch in Theodore Roosevelt National Park. The trail ride we did there was definitely a trip highlight. After the crowds of Yellowstone, nothing could have been more relaxing than seeing a nearly-empty park from atop a trusty animal. Even though they pretty much know to follow the horse in front of them, you’re in control just enough to feel like a real cowboy. Our group of 7 included the guide, a Swiss man and his children and the two of us. Calvin and I brought up the rear of the line, which was great for both the landscape views and for the comedic aspect of Rudy’s hill-ascending flatulence. The wildlife sightings were great without hundreds of loud people scaring everything away. We traveled through prairie dog towns, saw bison, deer and a rattlesnake. Then, as if on cue, a family of wild horses (a stallion, his three mares and two babies) appeared at the top of a ridge just a few yards from us. They stood in the breeze watching us pass with their manes blowing as if posing for a Thomas Moran painting. It was surreal. The park was green and heavily vegetated this summer due to abnormally high rainfall. This also caused some horse-related headaches as passing through acres of lush grass proves tempting for a hungry animal. The instructions “don’t let your horse eat” can be hard to follow. When an 1,100 pound mammal wants a blade of grass to snack on, he’s going to get it no matter how hard you pull on his head. Our trail guide Laura kept us informed on geology, animals and weather patterns of the region, reminding us how important it is to slow down and look around as often as possible. Usually in hotels, everyone does their best to keep to themselves. 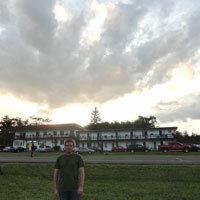 That was not the case with our neighbors Brad and Marcia at Cape Superior Inn just north of Duluth, Minnesota. The married couple from Minneapolis was not about to let us leave our room without chatting. Small talk on the porch quickly became an invitation to have a shot of Irish Whiskey. “Shot” by their definition meant half a Solo cup. We reciprocated by busting out our growler of Summer Daze Doppenweiss that had been riding (and maybe spilling a bit) in the trunk of the Malibu since Red Lodge. Over the next hour and a half, we shared travel stories and discovered we’d visited many of the same places. Brad had experienced Beartooth Pass on a motorcycle some years back and they both enjoy New Glarus Brewing in Wisconsin, one of our favorites. You never know who you’re going to run into on the road, but you’ll always find you have something in common when you least expect it. 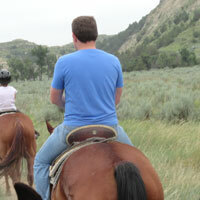 This entry was posted in Destinations and tagged Beartooth Pass, Cape Superior Inn, Grand Teton National Park, National Park road trip, Peaceful Valley Ranch trail rides, Seattle to chicago road trip, Theodore Roosevelt National Park. Bookmark the permalink.